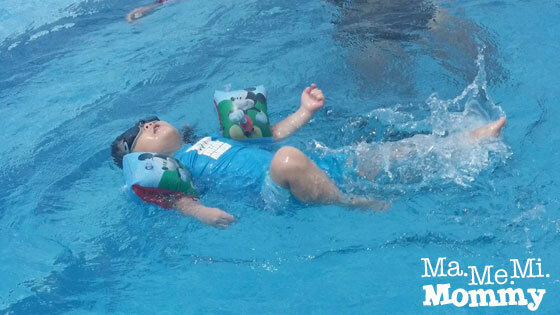 With DA’s short stint as a McDo Kiddie Crew over, we’ve decided to get back to his swimming lessons. We went back to his teacher from last summer and it’s a good thing that he still has a slot left. Yey! We met Coach Don back when DA and I frequented the condo pool. We were always cooling off in the pool and we’d see the coach there teaching little kids. DA was barely three then and I wasn’t quite sure how he’ll take it so we decided to just do a trial. It must be DA’s sheer love of the water, coupled with the coach’s natural charisma with kids, DA soon warmed up to him and was ready for more. 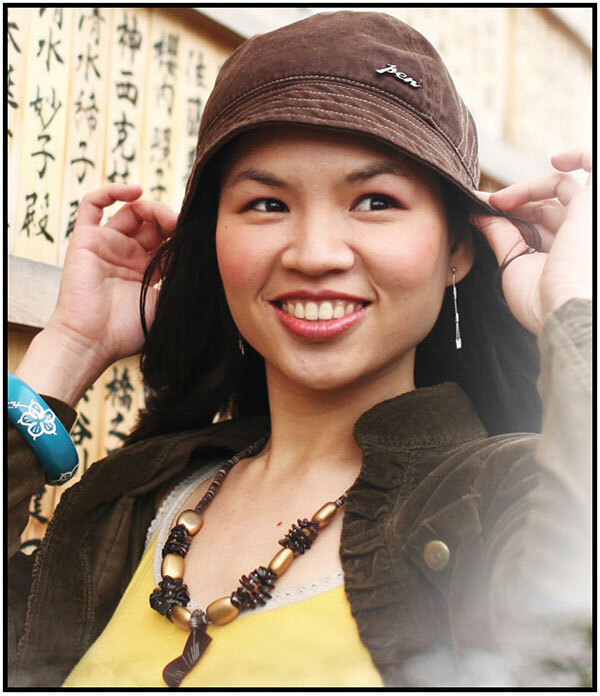 It wasn’t long before I decided to sign him up for the 12-session course, which costed P5,000. Each session lasted around an hour, depending on how tired the child gets. There were no more than 2 students per class, which gave the kids ample teacher attention. As the classes progressed, I watched from the sidelines, witnessing how the little boy turned from a child who just played in the water to someone who could actually swim. 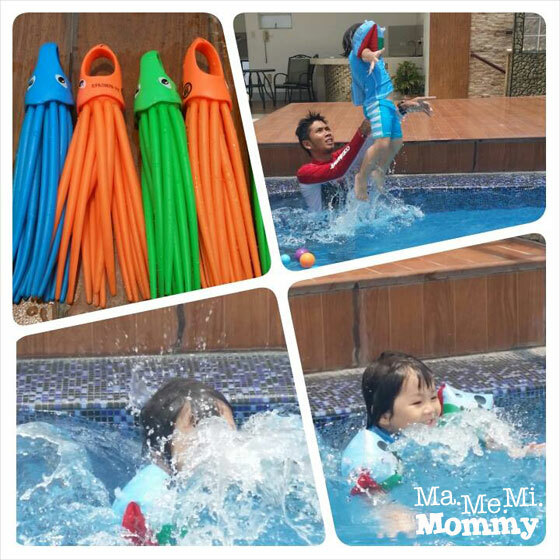 I’ll share here some highlights of DA’s swim class with coach Don. Day 1-2: The first few sessions were mostly for the child to get accustomed to the coach. DA was clingy and crying on the first day. By the second day, I left him alone with the coach, despite his kicks and cries, and just watched from a well hidden spot. The coach had enough toys in his arsenal that it wasn’t long before DA quieted down and started paying attention. Day 3: These fun looking squids are among the toys in the coach’s toy chest. They sink under the water and are so fun to catch. Top right photo shows the coach doing the “cannonball”. He’d throw DA up in the air like a cannonball and he’d splash back to the water. He was already all smiles, as you can see. Day 4: By the 4th session, he was confident enough to float on the water and was doing kicks already. Day 5: By this time, his arm floaters were off already and he was taught how to reach the floor and get back up. He was so happy when he was able to do it. “I did it, I did it, mommy!” 🙂 (I remember because I was able to take a video of it.) By this time also, they were doing cannonballs with no floaters on already. How fun! Day 7-9: DA was able to go on farther stretches in the following days. I dare not share the videos because I was noisily cheering in the background hahahaha! It sure was a summer well spent! 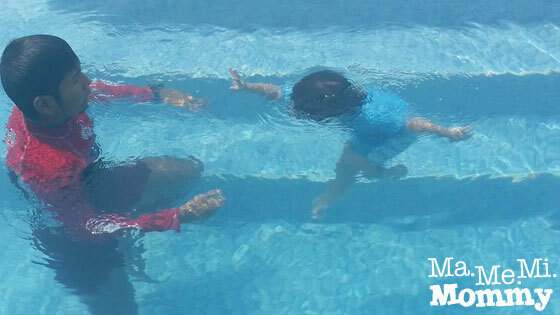 If you’re still looking for a summer activity for your child, I would definitely suggest swimming classes. Swimming is an essential life skill and it sure is a great way to beat this summer heat (so hot, right??). And if you’re looking for the right coach to do it, check below for Coach Don’s contact information. Reasonably Priced. His rate is at par and at times even lower than other swimming schools. One-on-one. He allows only a few students per class, which makes the teaching more tutok. Kid-friendly. He comes prepared with his arsenal of toys as a way to befriend the kids and win their trust. Output Driven. I’ve had some friends asking where DA learned how to swim because their children did not learn how to swim without floaters on from their respective swimming classes. Here, since it’s almost like a one-on-one session, your child is sure to learn better and faster. Ooh! How fun! 😀 We’re taking baby and me swimming classes next month! This post, along with the photos and videos are getting me even more excited! 😀 Favorite ko yung Day 5! Galing naman ni DA! 🙂 Thank you so much for sharing! Your son had a grand time swimming! I haven’t enrolled my son in swimming lessons yet (a must since I cannot teach him how – I also need lessons! ), but we’ll surely look into it. Maan, where is this pool located? I’d love my youngest to learn swimming and I think Coach Don is good. I’ll pm you. Oh I want to enroll Jacob also to a swimming class! Where does he do his classes? Hi! I always want to enroll my kids in a swimming class but whenever I checked the fee, its waaaay out of our budget. Ang mamahal! Coach Don seems a very practical and effective trainer? Will definitely give him a call. Thanks Mommy for sharing this! How old is your son? I’m thinking of enrolling my three-year old also but husband said siya nalang daw magtuturo. Hahaha! Thank you for your recommendation, Coach Donato seems like a really good coach. I’ll sure have my daughter attend a swimming class, it is necessary to learn how to swim. I’m not good at swimming, I can only swim a short distance then get tired easily, obviously because my way is wrong, lol. Haha, me too. And I’m scared if I can’t reach the floor. That’s on my bucket list – to know how to swim. I will learn it with my son soon! Ang galing!!!!! Thanks for posting his contact details!!! I want Skye to do swimming lessons too. Kasi I don’t know how to swim. 🙁 Ayoko matulad sya sa akin. I want my daughter to learn how to swim as well. It pays off to get them start early. Your little one seemed to have enjoyed his swimming lessons. Sounds good where are the classes?